I made this fun new twist on lasagna a few days ago and we absolutely loved them! It’s got all the great lasagna flavors piled on top of a warm garlic toasted ciabatta rolls, talk about yummy! Add a salad on the side and you’ve got a fun dinner idea that the family is sure to love! I told you my summer recipes were going to be on the quick and easy side, so yes, I used a jar of store bought pasta sauce. I’m not prideful when it comes to saving some time, and I have to admit, if you add some fresh basil to a jar of Classico, it really gives it a fresh homemade taste. If you have a hard time finding my favorite garlic ciabatta rolls from Walmart, no worries, any good crusty loaf of bread will do. This is another can’t mess up type of recipe, and it doesn’t hurt that it’s quick and easy! One tip though: Splurge on the fresh mozzarella for the top, really makes a difference! Hope everyone has a great week. Happy Cooking! 3. Split each ciabatta roll and place cut side up onto a large baking sheet. Spread ricotta mixture over each roll, about ¼ Cup (*you probably won’t use all of ricotta.). Top with a couple spoonfuls of pasta sauce, and fresh mozzarella cheese. *If you don’t use all of your ricotta, save it and use it in a pasta dish for later in the week. I made a baked pasta dish where I stuffed the ricotta in the middle of some penne with red sauce, it was great. Those looks so good! I love the combo of lasagna and ciabattas! Mmmm, Jenny I love ciabatta rolls. I love the chewy crust and what a good idea to make pizza with them! Thanks for sharing this good and easy recipe. I think it will be a summer meal for us for sure! They look so good. It is not even 7:30 but I could eat them for breakfast! I wish my Walmart had those ciabatta rolls. Those look really yummy! Just might have to give them a try this week…Thanks Jenny! We have some kind of hot dinner sandwich at least once a week. I’ve got to get some of the ciabatta. It might be worth a trip to Walmart just for that. Actually, I have to go tomorrow. I’m teaching my Laurels to make cheesecake this week! When you need lots of cheap supplies, Walmart is the only place to go. I will definitely be trying these out soon! My family would absolutely go crazy over these. Thanks Jenny! Wow, Jenny, this blog is amazing! I just sat here for the last 30 minutes going thru tons of old posts. I am so impressed! You truly inspire me to cook more. Thanks for all the fun recipes. I have a feeling I’ll be making these a few more times this summer. Thanks! I wonder why those darn Walmarts don’t keep the same ingredients on stock?! Frustrating. Hope your Walmart carries them, it’s the first thing I pick up on my list when I go! Good luck with the cheesecakes, sounds fun! It’s been a long time, great to hear from you! Hope all is well with your cute family. I found your blog as well, very creative! Hope to chit chat again soon! I have no problems with canned pasta sauce – many times it tastes just as good as homemade! 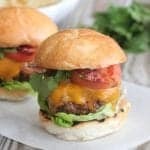 I’m looking for some really easy meals like this (great for summertime) so I’m saving this one for sure! Gonna have to try this. Yummy! I gotta catch up with you, girl! Been crazy busy! Anyway, These look sooooo…me…but every time I swing into Walmart to find those ciabattas, they’re gone! Rats! I guess I better hang around round back by the docks, waiting for the bread truck! I’m with you on the jarred pasta sauce. As long as it’s a good brand, I’m all over it! You are just quite the traveling woman this summer huh? Lucky. I get so bummed if my ciabattas are not available for the day. I try to go in the morning and usually find them. They are right across from the cakes at my Walmart. Talk to you soon! My mouth is watering over here!!! Hey snitchy, my mouth is watering…especially since I’m doing South Beach phase 1 this week to get ready for California…and I’m not eating bread!! Wow, this sounds great! Exactly something I would want to eat. We usually use jarred sauce, too. I’ve made homemade, but it does take extra time. This time of year really does get busy. Found this from my cousin, Kristen’s blog. I am also in AZ. and I have 5 picky eaters. This looks easy and yummy. I can’t wait to try it! Something new is always a good thing when the cook gets stuck in a rut! Those look fantastic! I’m not afraid to use a bottle of Classico either… always keep it on hand on those days when dinner has to hit the table, but fast! Thanks for sharing your quick and easy recipes! It appears as if you have a popular recipe here !! !Thanks for posting this and I am adding it my meal plan for next week nice and easy my kind of meal..have a great week.. I really like the sound of lasagna on a crispy ciabatta!! I’m Amber Whiting (Artie’s wife) I came across your blog and started trying your recipes. They are so good. I mentioned the blog to Artie and he told me he knows you guys. Can’t wait to try the cookie dough brownie bites. Yum! Hi, I just found your blog and I am SO excited to try some of your recipes! My husband is in the running for worlds pickiest eater and as I was looking through pages and pages of your recipes he would occasionally say, “hey that looks good, try that one” HE has NEVER said that about a recipe I wanted to try! Thanks!! Now I know what I’m fixing for dinner tonight! Thanks for the great idea. i tried this tonight and it was so yummy! everyone loved it! Great recipe…I tried it last night and my husband and son LOVED it!!! this looks sooooo good – and easy! I tried this one tonight too. Two thumbs up! Every recipe I have tried of yours has been added to our “keeper” list!!! Thank you so much!!! Yum, yum, yum! Made this a few mights ago and loved it. Our Wal-Mart also did not have the garlic ciabattas when I went so I bought a loaf of french bread instead. So easy and sooooo good. We have been enjoying the leftovers, too.